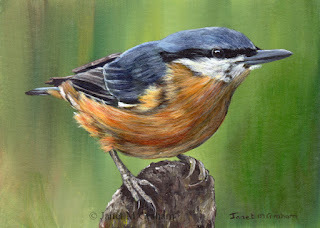 I love this ones markings and rather enjoyed the challenge of painting them. 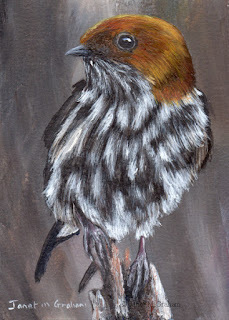 Lesser Striped Swallow is a large swallow found in Africa. They measure around 10 - 15 cm in length. Lesser Striped Swallow measures 2.5 x 3.5 inches and is painted on Colourfix Smooth paper. This one was rather fun to paint as it is always a bit tricky when painting just black feathers. Rather pleased with how it turned out. Phainopepla's are a songbird found in South Western United States and Mexico. Its name is derived from the Greek words phain pepla which means "shining robe" and is in reference to the males shiny jet black plumage. They measure around 18 - 21 cm in length and weigh between 18 - 28 grams. A individual bird can eat up to 1100 mistletoe berries in one day if they are available. 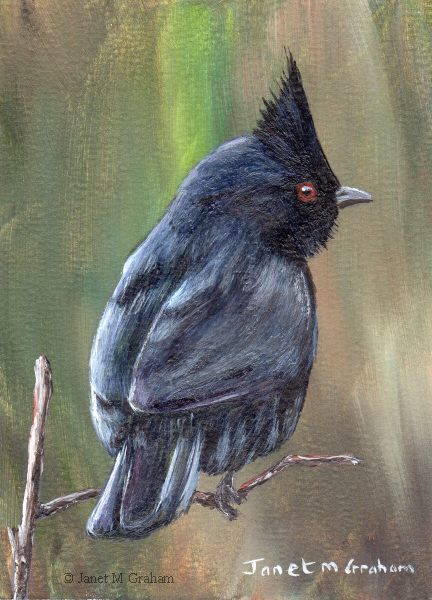 Phainopepla measures 2.5 x 3.5 inches and is painted on Colourfix Smooth paper. 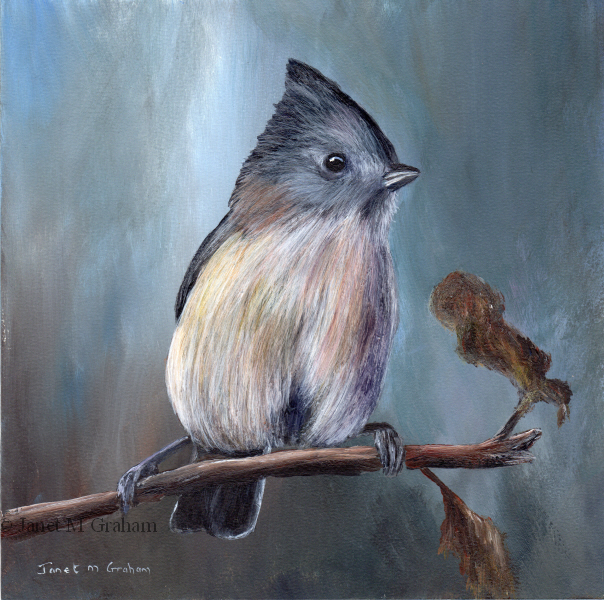 I love painting these birds so I couldn't resist painting this one. Nuthatch measures 5 x 7 inches and is painted on Colourfix Suede paper. Rufous Capped Warbler No 3 measures 5 x 5 inches and is painted on Colourfix Smooth paper. 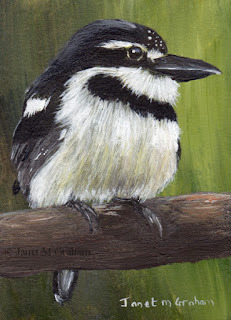 I couldn't resist painting this one - just love how it all puffed up. 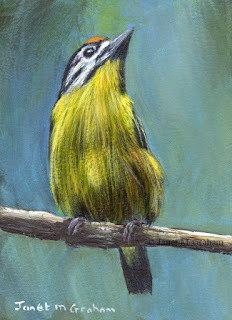 Pied Puffbirds are found in South America from Costa Rica through to Brazil. 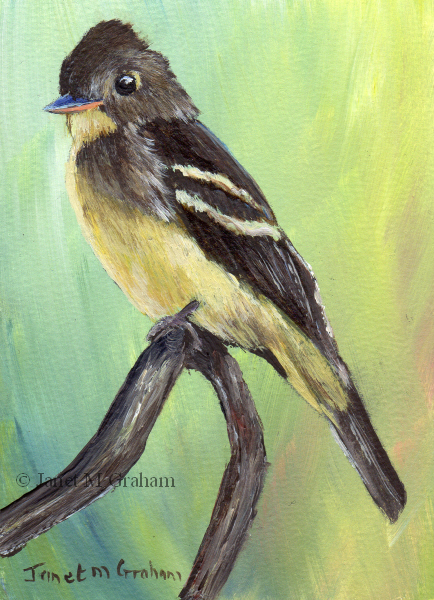 Pied Puffbird measures 2.5 x 3.5 inches and is painted on Colourfix Smooth Paper. I love how this one is perched on the branch. This is an immature one as it's black and white head stripes have not yet fully developed. 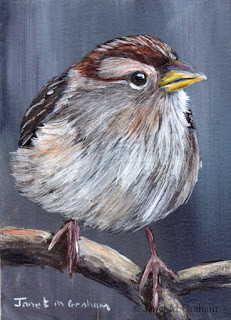 White Crowded Sparrows are native to North America. 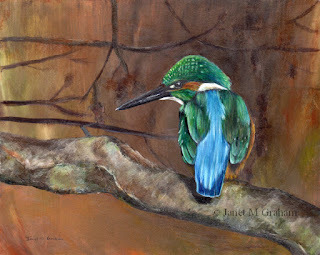 They measure around 15 - 16 cm in length and weigh between 25 - 28 grams. White Crowned Sparrow measures 2.5 x 3.5 inches and is painted on Colourfix Smooth paper. 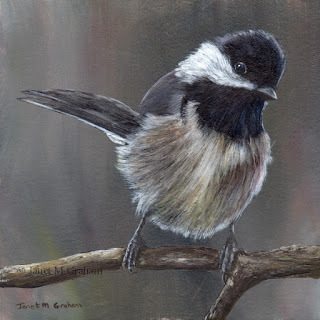 I took the reference photo for this one a few years back. Really pleased with how it turned out. 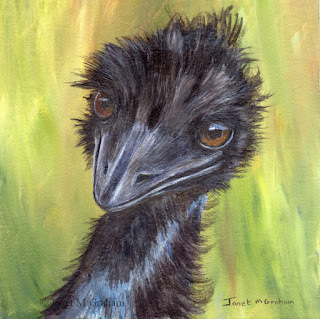 Emu measures 5 x 5 inches and is painted on Colourfix Suede Paper. Western Bluebird measures 5 x 5 inches and is painted on Colourfix Smooth Paper. 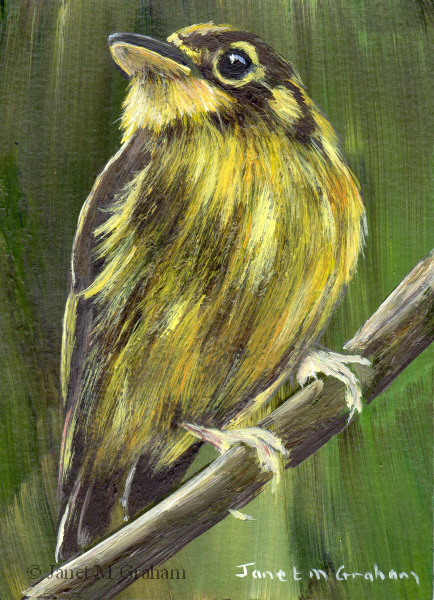 I love the different shaped beak of this one. Really pleased with how it turned out. 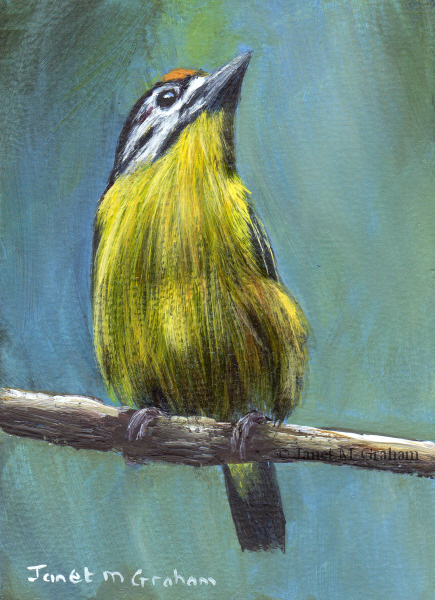 White Throated Spadebills are found in Tropical Americas. They measure around 9.7 cm in length and weigh around 9.3 grams. 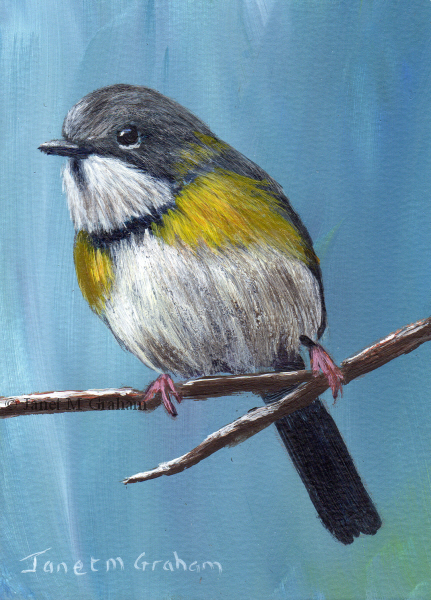 White Throated Spadebill measures 2.5 x 3.5 inches and is painted on Colourfix Smooth paper. I love painting the autumn colours. Really love how this one turned. 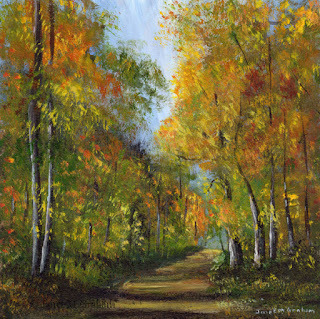 Autumn Days measures 6 x 6 inches and is painted on Colourfix Suede Paper. Many thanks to Shanna Leigh for the reference photo. This one was really fun to paint - everything just seemed to work and I love its perky tail. Marsh Wrens are a small North American songbird. 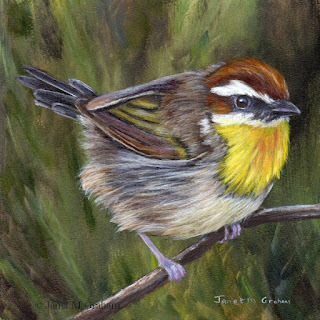 They measure between 10 - 14 cm length and around weigh 9 - 14 grams. 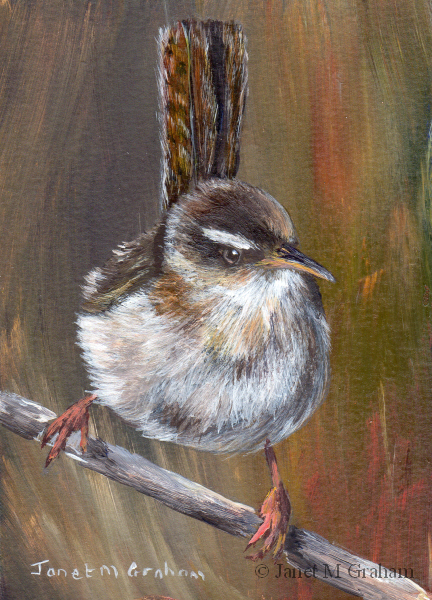 Marsh Wren measures 2.5 x 3.5 inches and is painted on Colourfix Smooth Paper. 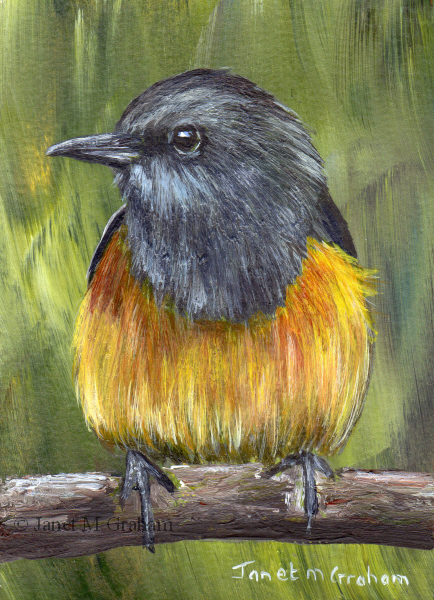 Little Rock Thrushes are found in Africa. They measure between 15 - 16 cm and are the smallest of the rock thrushes. 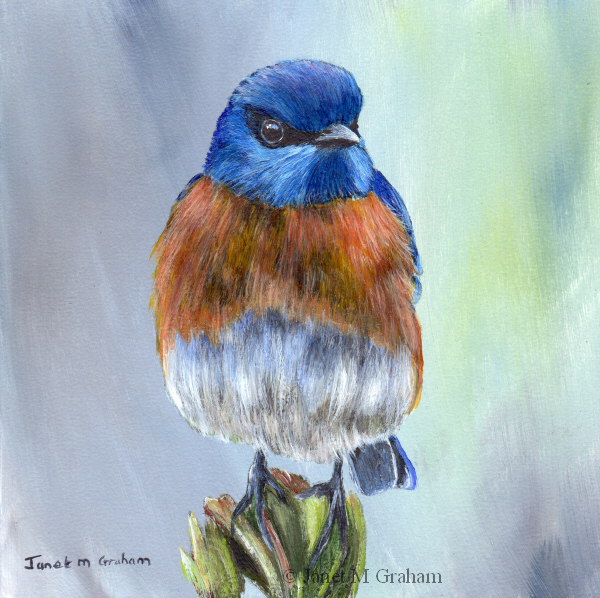 Little Rock Thrush measures 2.5 x 3.5 inches and is painted on Colourfix Smooth Paper. 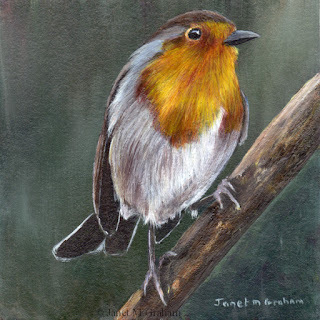 I love painting robins so decide to paint this little guy. Robin No 12 measures 4 x 4 inches and is painted on Colourfix Suede Paper.